In 1986, after graduating from college with a B.S. in Electrical Engineering in Massachusetts, Linda Ehlers took up the art of stained glass as a hobby to give herself a break from math and computers. She kept this hobby up for 8 years, when after two blizzards and a month of rain (restricting outdoor activity in Massachusetts for 6 months), Linda and her husband decided to move to sunny Colorado in 1994. Health issues caused Linda to start a stained glass business instead of going back to engineering full time. In April, Linda started making custom stained glass windows for new houses in her area and by fall she was teaching a glass class for the East Boulder County New Comer’s Club. She discovered that she liked teaching and started teaching her own classes out of her basement shortly after this. Later she started teaching for Boulder Valley’s Life Long Learning program in November of 1995. She greatly expanded her knowledge of glass art by taking classes all over the country and now offers classes in glass fusing, mosaics, stepping stones, and wire wrapping jewelry as well as stained glass. Specialty classes are also offered in Kaiser-Lee board, fusing with frit, beveled snowflakes, fused ornaments, fused jewelry, dam fusing, and mosaic pots. Linda is a member of the East Boulder County Artist and sells her art at galleries and shows, and still makes custom windows as well as doing window repairs. 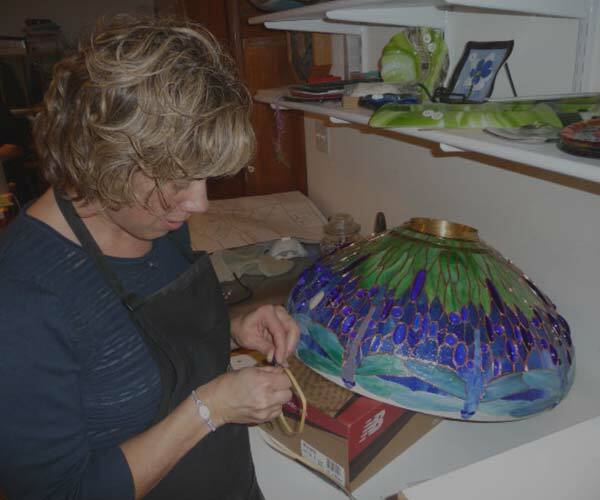 Stop by her studio/house to see her 3 Tiffany reproduction lamps as well as the rest of her stained glass “museum”.